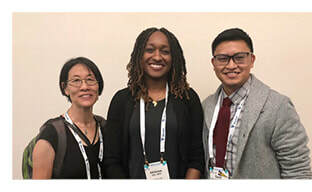 ​Adrienne Hall (center) at the American Public Health Association annual meeting with team member Irene Yen (UC Merced, BUILD Mentor) and David Rebanal, SF State assistant professor of health education. Adrienne Hall (MPH, ’18), Health Equity Institute (HEI) research associate, delivered a team presentation, “From West Point to Hunters View: Race, class, and the health effects of public housing redevelopment,” co-authored with Laura Mamo (co-principal investigator), HEI professor of health education; Melissa Hagan, assistant professor of psychology; and colleagues from UCSF Leslie Dubbin (co-principal investigator) and Irene Yen(co-principal investigator), at the 2018 annual meeting of the American Public Health Association (APHA) in San Diego. ​Melissa Hagan and her co-authors, Michael Sladek, Linda Luecken, & Leah Doane published a study in the Journal of American College Health that found 25% of young adult college students experienced clinical levels of traumatic stress symptoms 1-2 months following the 2016 U.S. Presidential Election. Check out the interview with Dr. Hagan in the Washington Post.